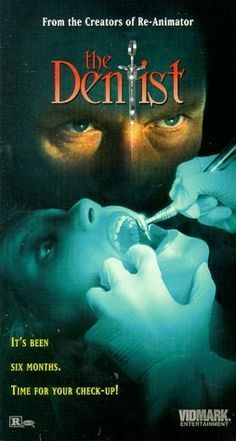 “The Dentist” was directed by frequent Stuart Gordon collaborator and producer Brian Yuzna, and is one of the few works that Stuart Gordon only wrote and did not direct. Once again, it was written in cooperation with his frequent writing partner Dennis Paoli, though the screenplay was later significantly re-worked and altered by a third writer, Charles Finch. Something that is impossible not to notice about “The Dentist” is the disorienting and at times nauseating cinematography. It is incredibly heavy-handed, but I have kind of grown to love it. Everything throughout the film is so way overdone, the bizarre shots more or less fit in with the rest of the production. Interestingly, the cinematography work had to be split between two men, because the initial director of photography (Dennis Maloney) had to withdraw part way through filming due to a family emergency. The final credit was given to Levie Isaacks, who came in as his relief. 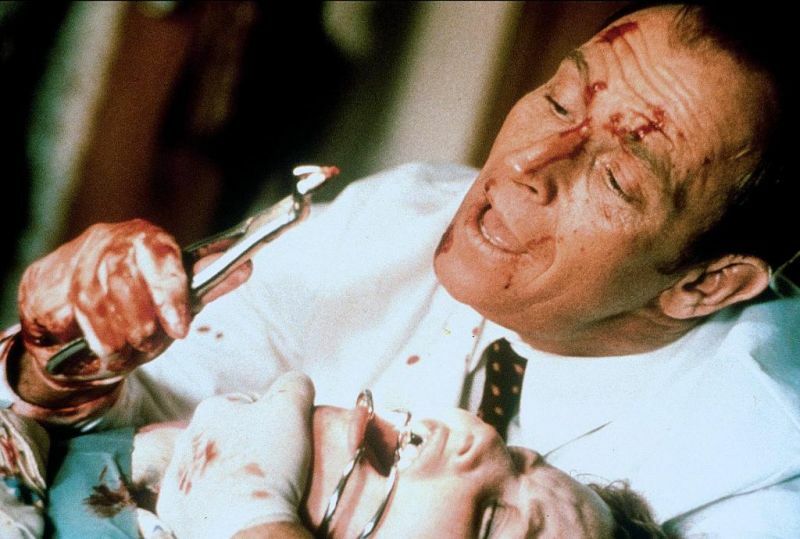 The cast of “The Dentist” is led by Corbin Bernsen, in what is certainly his defining role. 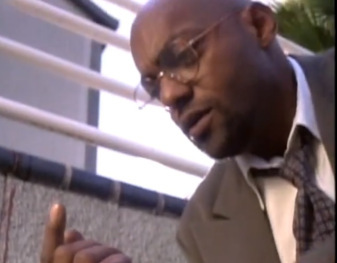 Ken Foree, who worked with Stuart Gordon on “From Beyond,” plays a police officer who ultimately catches onto the killer dentist’s trail. Linda Hoffman gets the honor of playing Bernsen’s long-suffering and unfaithful wife, who gets to ham up her material quite a bit in her own right. Last but not least, buried way down in the accessory cast is “The Avengers” member Mark Ruffalo, who plays a scummy talent agent who brings his model client in for a dental check up. The story of “The Dentist” follows the progressive mental breakdown of one Dr. Feinstone, who, over the course of a day, is blackmailed by an IRS agent, discovers his wife’s infidelity, and finds that his favorite shirt has been ruined by a stain. This leads him to commit a string of murders over the course of his subsequent work-day at the dental office. These antics are somehow not discovered until after working hours have ended, and Feinstone has slipped away undetected. It is all pretty outlandish, to say the least. The inspiration for “The Dentist” comes from the story of a real life serial killer dentist named Glennon Engleman. Interestingly, Corbin Bernsen played him in a television movie, “Beyond Suspicion,” years before the making of “The Dentist.” It may well have been a feather in his cap when it came to casting on the flick, for better or worse. “The Dentist” was reportedly shot over the course of only 18 days, and cost only $2.5 million in total to make. Some of the cuts made to keep costs down included not having a story-board artist, excluding prop furniture from the budget, and reusing the special effects props: notably the oversized mouth, which had interchangeable teeth to indicate different characters. Speaking of which, the designer of that effect, the highly acclaimed make-up effects artist Kevin Yagher, reportedly agreed to do his work on “The Dentist” as a favor, as he was reportedly far out of the production’s price range. At one point, Corbin Bernsen’s character shoots and kills a neighbor’s dog. This incident leads to the police launching a formal investigation, which ultimately leads to his capture. During the sequence where the cops are investigating the crime scene, the dead dog shown is actually a stuffed goat, because apparently the production couldn’t come up with a convincing stuffed dog on that day of filming, but a goat was readily available. This is the kind of production story you just can’t make up. The reception to “The Dentist” was overwhelmingly negative, with at least one reviewer uncertain if the movie was supposed to be a genre-mocking comedy or an earnest horror/thriller. The movie currently holds a 0% critic score on Rotten Tomatoes, alongside a 28% audience score. The IMDb rating is a bit higher with a 5.1, which I am going to believe is due to people now watching this as a good-bad flick in retrospect. To put it mildly, Corbin Bernsen goes completely over the top and through the roof with his performance in this film. His dialogue is so venomous, faux-erudite, and delivered with such excessive, bitter intensity that it is absolutely hilarious. He meanders on about about the “filth” and “decay” in society with all of the focus, drive, and self-righteousness of a firebrand preacher railing against the foreign, vague evils of short-haired women and the godless undisciplined youth, and his content is equally as nonsensical as any backwoods testament you could dig up. 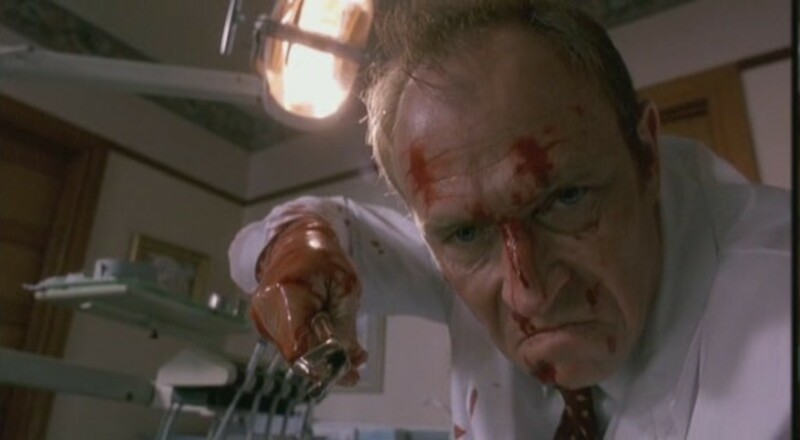 Most of the film consists of either Bernsen on one of these ranting tangents, or him slowly torturing people with poor dentistry practices (or, more often, a mixture of both). The entertainment value comes from both his performance, and from the clear bafflement of all of the accessory characters around him, who never seem to catch on to the fact that he’s losing his grip. The assistant allows him to carry on, but looks thoroughly disturbed and perplexed by the statement. This is almost the perfect encapsulation of the movie: meandering, lunatic dialogue by Bernsen, followed by perplexed reactions from the straight characters surrounding him, who ultimately do nothing to interfere. I am pretty sure that Detective 2 (named “Sunshine,” by the way) would just straight-up fail a Turing test. How does that line (with that delivery) stay in this movie? Regardless of how it happened, I am glad it did, because these moments are absolutely golden. I probably have a bit of an excessive fondness for this movie, as it was my first exposure to Stuart Gordon, but I honestly feel that it is the least-appreciated film he has worked on. I still rewatch it on a regular basis, and I still absolutely love it. Corbin Bernen’s performance is one of the most heavy-handed, ridiculous things I have seen in any movie, and it totally makes the film. Ken Foree adds some delightful flair, and gets to show off the comedic chops that you only see glimpses of in “From Beyond.” When you add in the bonkers score and cinematography, “The Dentist” becomes a truly magnificent achievement in awfulness. “The Dentist” is without a doubt a fun, good-bad movie, and definitely deserves some more attention. 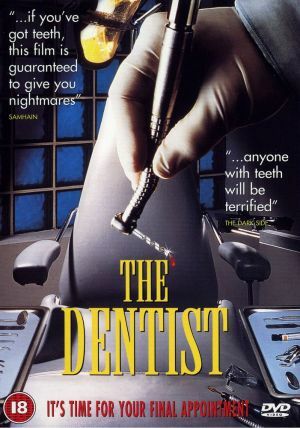 If you are looking for an awful horror film to showcase to friends, “The Dentist” is one worth considering. I would go so far as to schedule another visit every six months or so, just to check in. You don’t want your memory to decay, after all.